The Monte Rosa massif is the largest range of glaciated mountains in the Western Alps. The Matterhorn is the most iconic peak in Europe. ranges is the stuff of dreams. Splendid views abound, with scenery spanning the huge gleaming white glaciers, rocky spires and rugged cliffs of these Apennine peaks which form the frontier between Switzerland and Italy. The Tour of Monte Rosa and Tour of the Matterhorn treks are well known to me as I wrote the guidebooks to both. But having done these treks numerous times I have come to know the region intimately and am always enamoured with the Italian sections of both these multi-day hikes. The Italian valleys, peaks and passes are wilder and more remote than their Swiss neighbours and there is a feeling of freedom and fun on this side of the mountains. Add to that the Italian cuisine and hospitality and you’ve got the makings of a fabulous trip. 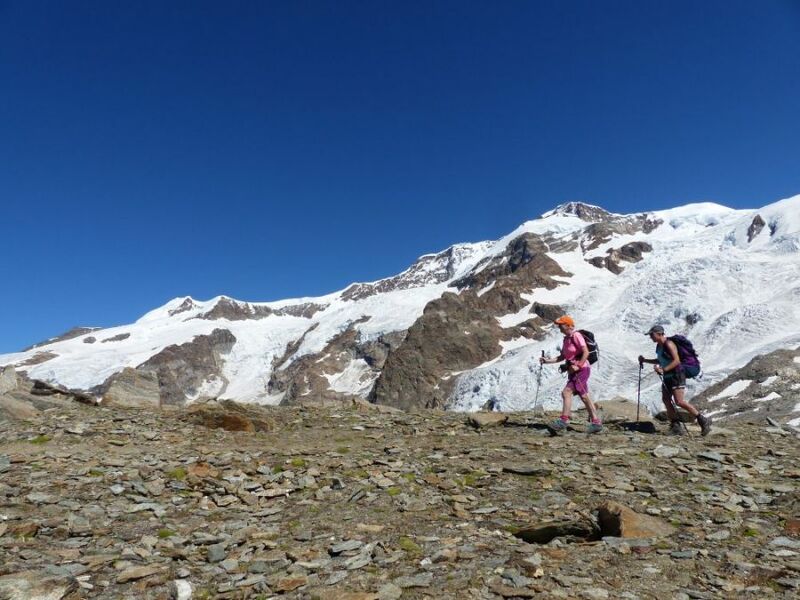 This trek is an itinerary I have made up to explore this fabulous region of the Alps and I have made sure we have time to include some alpine trekking peaks on our itinerary. 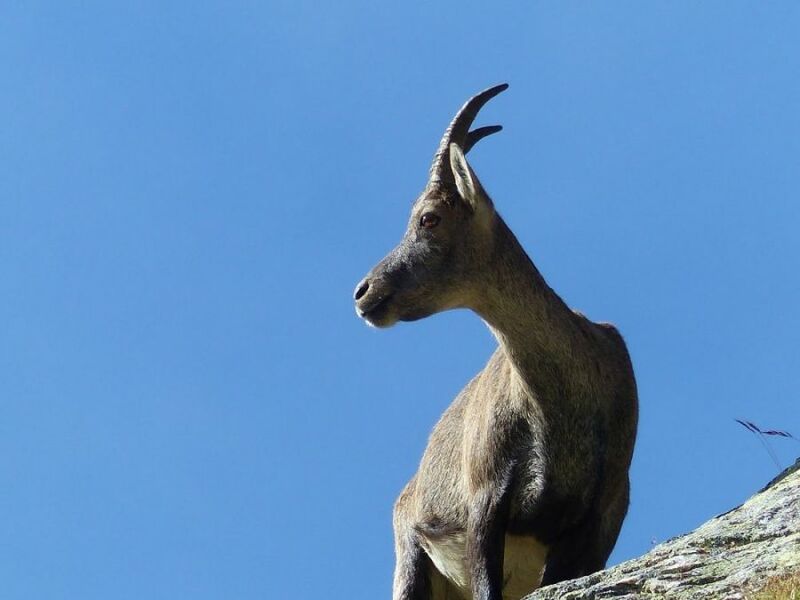 The area is a paradise for wildlife, notably the mountain ibex and we are sure to have some amazing early morning and late evening sightings. We start the trek with a night in a mountain hut which gives us the chance to do a summit on the 1st day and another one early morning on the 2nd day. This is our only night in basic accommodation....but nevertheless there are good facilities, warm rooms and excellent food and drink on offer. the rest of the trip we are spoiled in wonderful mountain hotels high above the valley, with beautiful rooms and great facilities. I have chosen accommodation where the welcome is warm, the rooms pleasant clean and comfortable and the food to die for. 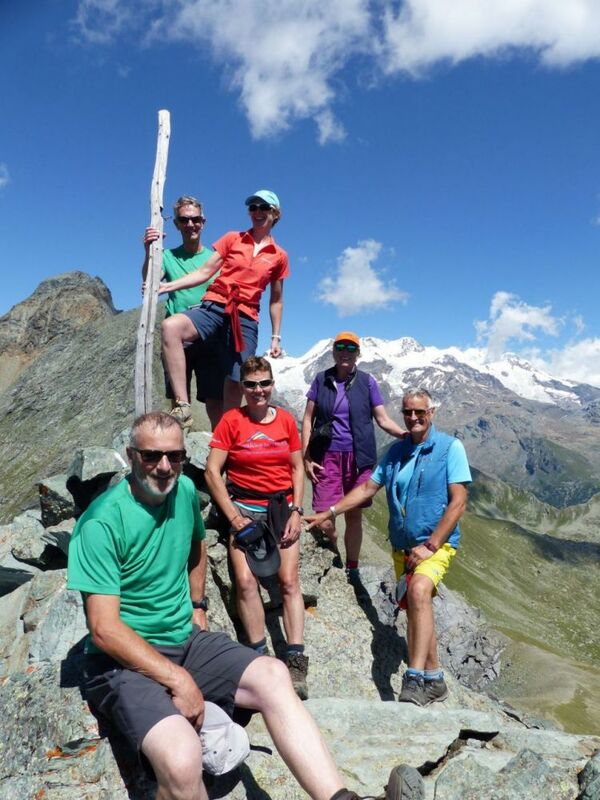 This is a trek for those who are looking for excellent walking, with a few hiking summits thrown in for good measure, and a chance to explore some of the secret spots I have discovered on my many treks around Monte Rosa and the Matterhorn. TRAVEL: The nearest airports are Geneva and Turin. Onwards travel by train and / or bus. ACCOMMODATION: The cost of all accommodation - bed, breakfast and evening meal (except the last night’s meal in Aosta) - is included in the price of the trip. In the hotels and mountain hotels the price is costed on double occupancy of rooms. There is just 1 night in a mountain hut where we sleep in a dormitory. EXTRA COSTS: You’ll need to buy picnic foods, drinks, as well as souvenirs and postcards of course. Also, travel to and from Aosta at the beginning and end of the trip. EQUIPMENT: A detailed list will be sent on booking. DIFFICULTY OF THE WALK: 2/3 This means it’s a trip that will appeal to people who are looking for a challenging and energetic mountain trek. However, this trek will also appeal to those who are also looking for comfortable accommodation with reasonable facilities. There will be uphill and down every day and you need to be in good hiking shape but it won’t be relentless and we will take plenty of time to enjoy the views. The terrain will at times be rugged and you do need to be a keen hillwalker to enjoy this week. Expect to be outside for around 8 hours a day. This time is NOT spent just walking! There’s plenty of time for rests, taking photos, eating, drinking and of course just enjoying the views.